A group of community leaders will call on San Diego residents Wednesday to participate in the 11th annual Stuff the Bus holiday food drive in the hope of curbing hunger and food insecurity in San Diego County. 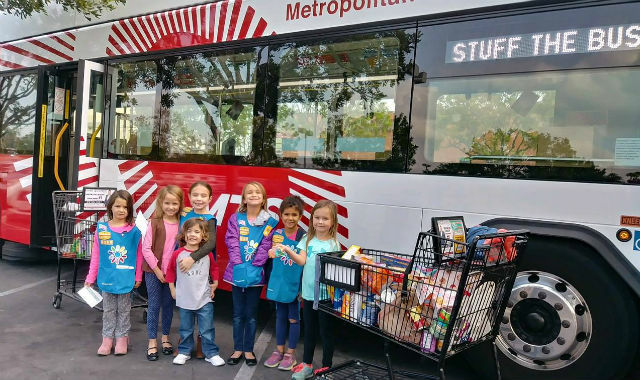 Representatives from the Metropolitan Transit System, the North County Transit District, Albertsons/Vons, Girl Scouts San Diego and the Jacobs and Cushman Food Bank are expected to attend the news conference in support of the Stuff the Bus campaign. The Girl Scouts in attendance will make a ceremonial donation to the food drive. According to county data from 2016, roughly 486,000 residents deal with food insecurity. About 163,000 residents in that figure are children. To combat hunger in San Diego County, Vons and Albertsons stores partnered with the Jacobs and Cushman Food Bank to accept food drive donations through Dec. 1. Residents can purchase a $5 preloaded bag of groceries to donate to the food drive at Vons stores and approved nonperishable food items at Albertsons stores. The food bank aims to collect a total of 30,000 pounds of food during this year’s drive. MTS Bus COO Bill Spraul, Jacobs and Cushman Food Bank President and CEO James Floros and Girl Scouts San Diego CEO Carol Dedrich are expected to attend the news conference, which is scheduled for 11 a.m. at the Vons at 3550 Murphy Canyon Road.